The Altima line of Nissan gets a total overhaul from its previous 2007 line and adapts a much sleeker and sportier look that combines coupe features and continuously variable transmission for more power and fuel economy. Now you can have a better looking coupe sedan that has straight forward yet racy profile evident in the interior and exterior characteristics of the car and still get responsive drive train features that you can expect from a Nissan. The Coupe design is quite distinctive since it is several inches shorter, sculpted rear flanks, and a more tapered roofline which make it more aerodynamically sound for an automobile. You also get good cabin tech for entertainment and navigation like the full hard drive based system that has traffic reporting and onboard music storage good for mp3s. Underneath the hood, the Altima Coupe has a 2.5-liter four-cylinder engine that only makes 170 horsepower and 175 pound-feet of torque, these are quite low numbers considering the displacement. In another aspect, the Altima Coupe earns a Partial Zero Emission Vehicle rating which means that it causes very few smog-causing pollutants. For petrol heads out there is bonus mileage, rated at 23 mpg/city and 32 mpg/highway by the EPA. 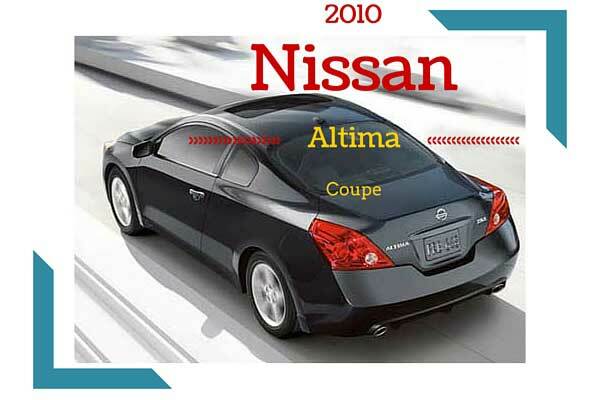 The engine doesn’t seem that powerful from the specifications but thanks to the CVT (Continuously Variable Transmission) manages to make use of it well, the CVT does not have any fixed gears which instead relies on bands, tensioners, and pulleys to produce an almost infinite number of gear ratios for the Altima Coupe. Notably, Nissan’s real secret is its excellent programming, which tells the CVT which range of ratios to use depending on engine speed, throttle input, and other data.